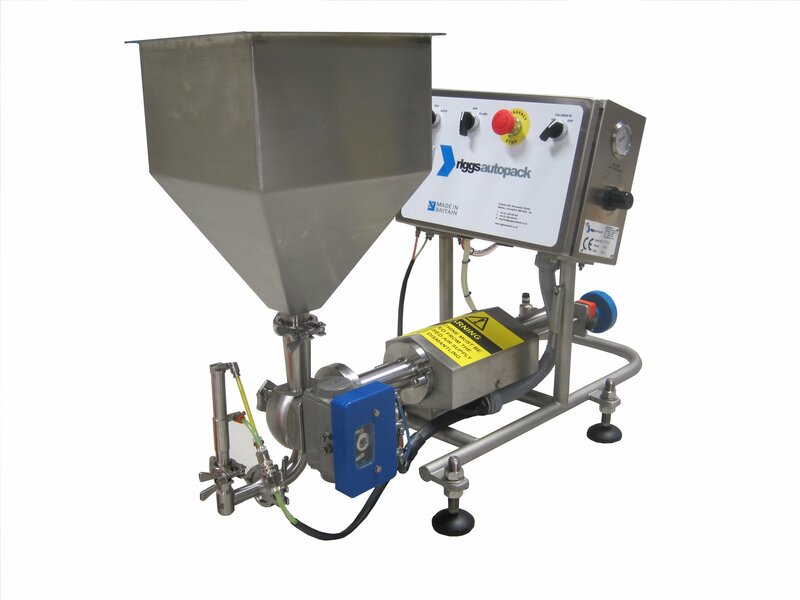 Riggs Autopack is a British manufacturer of high quality volumetric depositors and filling machines. We are an award winning UK market leader with an excellent reputation and supply our equipment to the food production industry. The main stay of the company is our Model 1000 semi-automatic filling machines, designed specifically for small scale food production, quick product change-over and short batch runs. Manually filling jars and other containers can be tiring and time consuming, often meaning much of the working week is spent in production fulfilling orders which can impact on promoting other areas of the business. By using a Riggs Autopack semi-automatic filling machine, there can be huge time and production savings resulting in dramatic benefits for small scale producers. Within the Model 1000 filling machine range, we pre-dominantly supply small scale food manufacturers with the Series 1 Micro, Series 2 Table Top, and Series 3 semi-automatic filling machines (as shown below). Our Series 1 Micro provides an overall deposit range of 3ml - 85ml, and accurately fills most types of container. 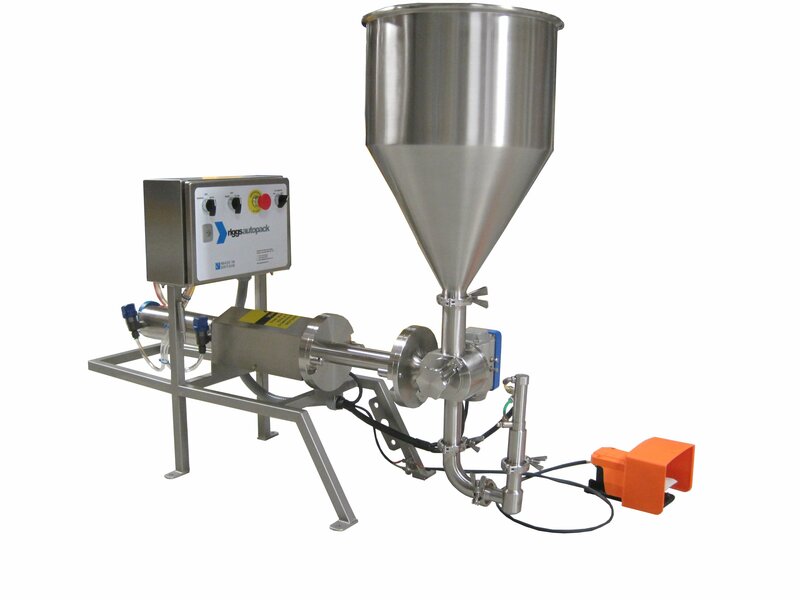 This bench mounted filling machine is available with a 15 or 25 litre hopper, purpose designed depositing nozzle to allow for clean product cut-off, and it provides damage free and highly precise depositing of hot or cold liquid and semi-liquid products. Our Series 2 Table Top provides an overall deposit range of 10ml – 5,000ml, and provides damage free and highly precise depositing of hot or cold liquid, semi-liquid and suspended solid products. It accurately fills most types or size of container and is available with a 40 litre hopper, purpose designed depositing nozzle to allow for clean product cut-off, and a bench mounted frame or bench to floor mounted mobile frame. Our popular Series 3 provides an overall deposit range of 10ml – 5,000ml, and provides damage free and highly precise depositing of hot or cold liquid, semi-liquid and suspended solid products. It accurately fills most types or size of container and is available with a 40 litre hopper or direct feed from a cooking kettle outlet, purpose designed depositing nozzle to allow for clean product cut-off, mobile frame with lockable castors and height adjustable filling table. If you're a small scale food producer seeking a high quality machine to accurately fill jars, bottles, pots, tubs, ready meal trays, buckets, pouches or bags, then Riggs Autopack could have the solution.